Be careful what your kid draws in school. 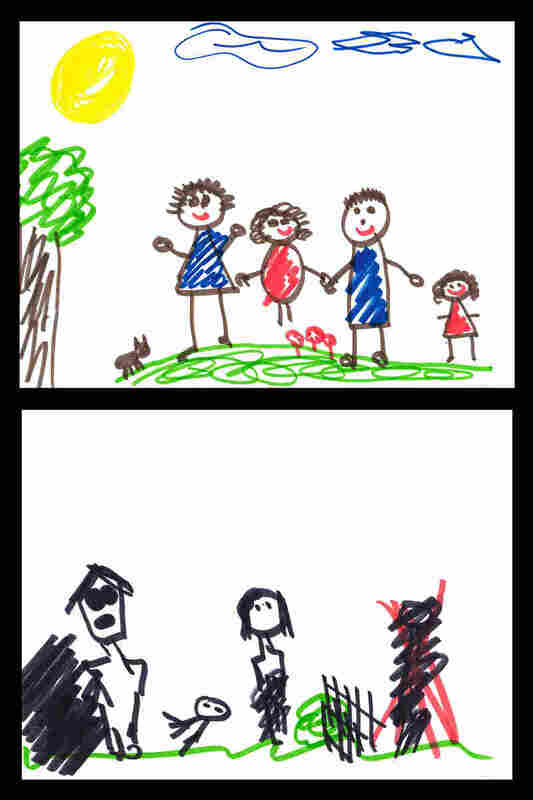 If his drawing is like the first one, you are in the clear. If it is like the second, you may get a call to CPS. Someday these drawings will be automatically scanned, uploaded to the cloud, and run thru the psycho-babble detector. We might also see more of this -- a video ad encouraging kids to steal their parents' gun, smuggle it into school, and give it to a teacher. Currently our silly zero tolerance laws make it a crime for the teacher to accept such a gun. And there is nothing wrong whatever with that second drawing, except that the kid only had a black marker and decided to cross one of the figures out and start again. I'm not so sure about that first picture. One child is in the center, levitating and holding Daddy's hand, while the younger child is off to the side like the pet.